I’ve been told that to worship is to kiss the face of God… beautiful imagery isn’t it? Worship is a symbol that no matter how far away we may feel God is right at hand and we can even kiss His face, a face that even Moses couldn’t set eyes upon; the face of the Yahweh the Creator. It is such a beautiful symbol. But what happens when that becomes twisted? What happens when we worship with our mouths but our lives become a contradiction of that worship? What happens when we acknowledge God with our lips but our hearts are far from Him? I have been pondering the story of Jesus’ betrayal. Judas, one of Christ’s closest followers leads some of the High Priest’s men, who will arrest Him and ultimately have Him crucified, to where Jesus is praying. Judas’ price was only 30 coins. And how did he betray Jesus? With a kiss. 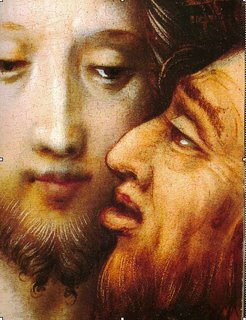 With a kiss upon Jesus’ face Judas sentenced Jesus to His flogging, His mocking, and His death. It’s really not the kiss that killed Jesus though is it? It’s the choice behind the kiss. It’s not the songs we sing to Jesus that really matter. It’s not what we do for an hour on Sunday morning or Wednesday night that really makes a difference. It’s the life behind the kiss that really matters. For Judas the kiss wasn’t really for Jesus, it was for himself. It was what he had to do to get what he wanted. Worship can sometimes be much more for us than for God. We kiss God’s face in order to check it off of some sort of spiritual list so we can go on living our life the way we want to and the worship has no constitution over our lives. Sometimes our kiss is the kiss of betrayal. It is a slap on the face of God. Worship goes far beyond the kiss. It’s our lives that God wants. It is the life that gives the kiss its meaning. If the life dishonors God and takes advantage of people then the kiss is a kiss of betrayal. But if the life is one that loves God and loves people and earnestly seeks to live in tune with God’s intention then the kiss is a kiss of worship. Is yours a kiss of betrayal or a kiss of worship? If it only took 30 coins to change Judas’ heart what would it take to change yours? Your price may be lower than you think. I realize that your point is not the same as mine, but I posted a long post on Judas last December. (No one has ever commented on it, thus I believe no one has read it. If they did, I am sure I would get reactions.) Nevertheless, I think it shows, based on simmering in N. T. Wright for many a late night, that most of us are a lot more like Judas than we ever cared to admit. (This part is close to your point (I think)). It is a long read (sorry), but I have preached the material on a few occasions, and it is has always gotten tremendous response at every venue. Well, I hate to be such a self blog promoter, but the relevance is overwhelming from my standpoint. I've been pondering the same thoughts latley, actually for quite some time. There were some days I would find what I was singing as empty and my mind was a hundred different places. Was this a true heart felt kiss? There were other times I would look at what I did over the course of a day and I would know that it was not worship either. This is a tough subject, but something I think we all need to be reminded of. Great post Wes! I'm sorry I never read the post. I will go back tonight and read it. I bet your thoughts on the subject are much more thorough than mine. I'll also be sending you an e-mail pretty soon with some questions if that's ok. Isn't it interesting that you cna tell when your life and words don't match? It becomes difficult to sing. Great thoughts! Good Thoughts, Wes. I suppose that my only question would be, "Where does ritual and singing worship fit into God's plan?" Is ritual worsip empty or less valuable than the way we live our lives? The kiss will always be important. That's why I started out my post talking about the symbol of worship. Ritual is a aymbol of the majesty and closeness of God (this might be paradoxical). the kiss is intimate. concerning the picture that accompanied your post, legend has it that the same man posed for both Jesus and Judus in that famous painting. Judus was the last one painted and the artist couldn't find a suitable subject. A man brought him a prisoner to pose for the part, and he sat there quietly until the painting was done, then he cried out - how far I have fallen, just three short years ago I posed for the protait of Jesus. I'm gonna go read Mike's too. yes, it really is a paradox. How did your grades turn out this semester? I ended up with a 3.2 GPA. pretty good by my standards. I would agree that worship is meaning less noise to God unless it comes from the heart. (and by noise I mean any act of meaningless worship). Most of us do go through this live thinking that this life revolves around us and that its all about us. We come by it honestly though. I mean when we are little and we cry we are picked up and held, so it seems about us, but its not. I say that to say this: many of us come to worship with the attitude of me,me,me,me,me. give me this and bless me when it should what can I give you God and How can I bless you with everything that I have. So yes it really is sad "the life behind the kiss". question is how do you help people to understand that.